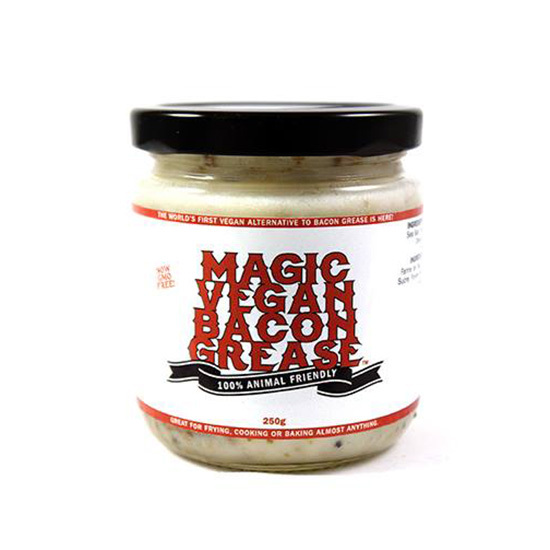 The world of vegan meat substitutions just got a little weirder with Magic Vegan Bacon Grease. Made of coconut oil, soy protein, sea salt, maple syrup, pepper, onion, garlic, torula yeast and smoke flavors, the fat can be used to fry or bake and may even be eaten straight on toast. In fact, its creators have an entire Tumblr dedicated to the grease’s many uses in recipes ranging from collard greens to cookies, basically any application that would benefit from "smoky, rich, bacony” flavor. The product hails from Ontario Canada and can be ordered online or picked up in one of the American health food stories found on this map.